Board games, card games and the like are some of the easiest and least expensive ways to experience real quality time with your friends and family. Some of my most favorite memories have occurred while playing a game like this and these times are often referred to now, even though they happened many years ago. McNeill Designs for Brighter Minds is a creator of several award-winning games, such as You've Been Sentenced and Twisted Fish. Fortunately, I had the opportunity to review these two games along with some other goodies too. Keep reading to learn how these award-winning games might help you make some very fond memories this holiday season! You've Been Sentenced Board Game, which retails for $24.95. Five Different Add-On Decks for You've Been Sentenced, which retail for $7.95 each. 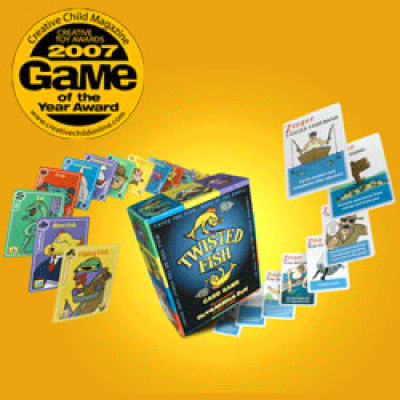 Twisted Fish Card Game, which retails for $9.95. 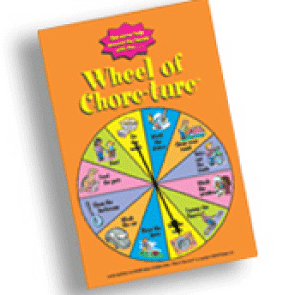 Wheel of Chore-ture Refrigerator Magnet, which retails for $3.00. Everyone gets 10 word cards face down and then flips them over at the same time and starts trying to create the longest sentence they can. Each word card contains five variations of a word or phrase which can be rotated to pick the word that best fits the grammatically correct sentence you are forming. Once you have finished constructing your sentence, knock on the table to signal that you are finished. The person who finishes first will be awarded 10 points. Once everyone has finished constructing their sentence, the players must then read aloud their sentence and argue why they should be allowed to get the points for it. If the group says that the sentence is correct, the player gets the total number of points from the words on the cards they used. If a player uses all 10 cards in their sentence, they get an additional 10 points. Whichever player scores 200 points first, wins the game! This game definitely offers a challenge and requires you to do some serious creating and possibly bulls******* to earn the points for your sentence! Michael and I played this game together and we laughed so hard at a few of the sentences we came up with. Sometimes, we laughed even harder at the arguments presented in defense of these crazy sentences. "Does yawning from the police station rocket colorful bombs?" For adults, if you added a little alcohol to the mix while playing this game, I'm sure it could quickly become a laugh riot! There are many variations of this game listed in the rules so you can find your favorite way to play it. Personally, I really liked the Casual and Deadwood styles of play. Although this game is recommended for children ages 8 and up, I think the younger ones might have a tougher time playing You've Been Sentenced. Teens and adults will probably experience the greatest amount of enjoyment from it, though this game could definitely help teach proper grammar and sentence structure to the younger players. This Christmas, I can't wait to gather everyone around the table and see what new memories will be made from playing You've Been Sentenced! Next up, was Twisted Fish, a card game recommended for 3-6 players ages 6 and up. This game is much like the title implies, Go Fish with a twist. In Twisted Fish, you play in the same style as the classic Go Fish card game, where you ask opponents for cards you need and discard and draw from the fish pond. But in Twisted Fish, there are some major differences introduced which add a little spice to this game. For instance, instead of trying to collect sets of four as you did when using a regular deck of cards, things are made more difficult by needing five cards in order to lay down a set. There are also brand new cards in this game called Zingers and Divine Intervention which add an entirely different strategy to the game. Zingers are specialty cards that allow players to circumnavigate the rules a bit and do unruly things, such as see other player's cards, steal cards, etc. These zinger cards can only be used once and must be discarded after they are used, but they definitely add a new level of play to the typical Go Fish game. Twisted Fish takes a little getting used to, but is a lot of fun to play! Michael and I both thought that this game was a refreshing update to an old classic and one that adults and even older children would enjoy playing again for the first time. Finally, I just love the Wheel of Chore-ture refrigerator magnet. Now, we have an instant way to divide and assign chores for punishment and especially when someone loses a game or bet in our house. So many times, Michael and I have wanted to wager on a sports game or other event to make watching it more interesting, but couldn't come up with anything to bet. Money isn't any fun to bet when you share bank accounts and checkbooks, so now we declare that the loser has to spin the Wheel of Chore-ture. This has made playing games and making wagers a lot more fun when you know that the Wheel of Chore-ture will be used to decide your fate if you lose! 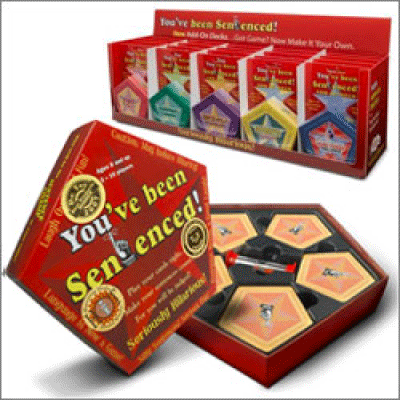 Disclosure: I received the You've Been Sentenced Game and Five Add-On Packs, the Twisted Fish Game and the Wheel of Chore-ture Refrigerator Magnet from McNeill Designs for Brighter Minds in order to facilitate my review. No other compensation was received. This product review is based on my own personal experiences with this item and is completely honest and objective.